How long will I be off of solid foods after Weight Loss Surgery? Immediately after surgery, your doctor will provide you with special dietary guidelines. You will need to follow these guidelines closely to prevent any complications. Patients start with a liquid diet, moving to full liquids, then soft foods and only solid foods once the risk to the surgical procedure performed is past. Allowing time for proper healing of your new stomach is necessary and important. Most of our surgeons recommend a period of approximately four weeks without solid foods after surgery. We will provide you with specific dietary guidelines from your specific surgeon for the best post-surgical outcome. Is there any difficulty in taking medications? Most pills or capsules are small enough to pass through the new stomach pouch. Initially, your doctor may suggest that medications be taken in liquid form or crushed. What do I need to do to be successful after surgery? When able to eat solids, protein in the form of lean meats (chicken, turkey, fish) and other low-fat sources should be eaten first. These should comprise at least half the volume of the meal eaten. What will the surgical staples used in some procedures do inside my abdomen? Is it OK in the future to have MRI tests? Will I set off metal detectors in airports? The staples used on the stomach and the intestines are very tiny in comparison to the staples you will have in your skin or staples you use in the office. Each staple is a tiny piece of titanium filament thread so small it is hard to see other than as a tiny bright spot. Because the metals used are inert in the body, most people are not allergic to staples and they usually do not cause any problems in the long run. The staple materials are also non-magnetic, which means that they will not be affected by MRI. The staples will not set off airport metal detectors. 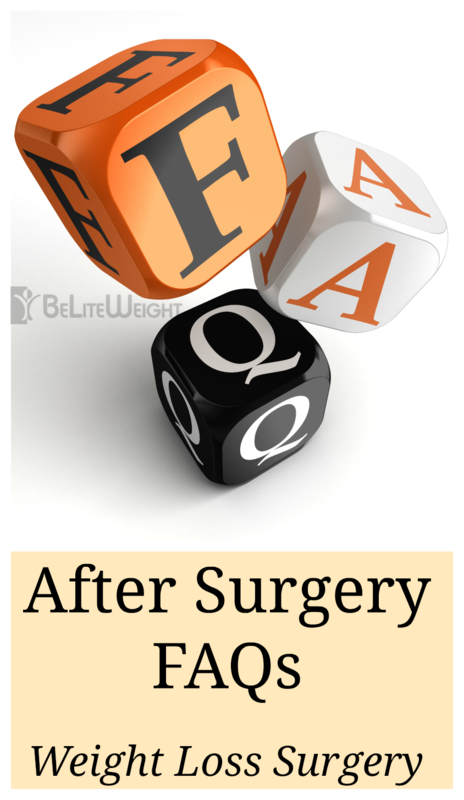 How much weight can I expect to lose with Weight Loss Surgery? Will the weight loss be quick? The amount of weight you lose and how fast you lose it depends on which weight loss surgery you have. Patients who have adjustable gastric banding (Lap-Band) procedures usually lose weight more slowly the first year than those who have gastric sleeve (VSG) or gastric bypass (RYGB) procedures. Can I become pregnant after Weight Loss Surgery? In many cases infertility issues prior to weight loss have been resolved post bariatric surgery. It is recommended that precautions for pregnancy be considered for at least 6 months after surgery. Many women who have had weight loss surgery, have become pregnant and have had children. Generally there are no adverse affects on a pregnancy. You should consult your physician as you plan for pregnancy. Will I have excess skin? And if so, what can I do to prevent it? Will I have to take vitamins? Yes, but the number depends on your weight loss procedure. The gastric bypass (RNY) procedure, because of the malabsorption properties, requires a lifetime of vitamin supplementation possibly more than once a day. The Lap Band requires a multivitamin every day. Will I experience hair loss after Weight Loss Surgery? Many patients experience some hair loss or thinning after surgery. This usually occurs between the fourth and the eighth month after surgery. Consistent intake of protein at mealtime is the most important prevention method. Also recommended are a daily zinc supplement and a good daily volume of fluid intake. This is usually a temporary condition. Most patients experience natural hair re-growth after the initial period of loss. Will I be hungry after Weight Loss Surgery since I am not eating much? Most patients say no. In fact, for the first four to six weeks patients have almost no appetite. Over the next several months the appetite returns, but it tends not to be a ravenous "eat everything in sight" type of hunger. What if I am still very hungry? Usually this is caused by the types of food you are consuming, especially starches (rice, pasta, potatoes). Increasing protein intake is helpful for many patients. There may also be a psychological problem with the lack of food in your life (“head hunger”). Although you are allowed to drink alcohol after your post operation diet, we recommend you are watching closely how much you are drinking when consuming alcohol. It has a lot of liquid calories that add up quickly! It also is possible to become intoxicated faster, so be careful. Can I drink carbonated beverages after surgery? Because the carbonation can potentially cause your stomach to stretch we highly suggest you do not drink these type of beverages after your weight loss surgery. Is there a difference in the outcome of surgery between men and women? Both men and women generally respond well to bariatric surgery. In general, men lose weight slightly faster than women do. Will Weight Loss Surgery improve my health? Weight loss surgery can eliminate or improve most obesity-related medical complications, including diabetes, hypertension, high cholesterol, sleep apnea, reflux and osteoarthritis, as well as stress incontinence, dermatitis, muscle and joint pain. Improvements in body image and a reduction in the symptoms of depression have also been reported. Weight loss may also be associated with improved fertility and more favorable pregnancy outcomes. Can I get my Weight Loss Surgery reversed? Although some procedures (such as the Gastric Band) can be reversed most cannot be reversed. We always advise people to think of Weight Loss Surgery as being permanent.